Finances and "bland" campaigns were the key talking points on the final TV debate before the presidential election this Friday. 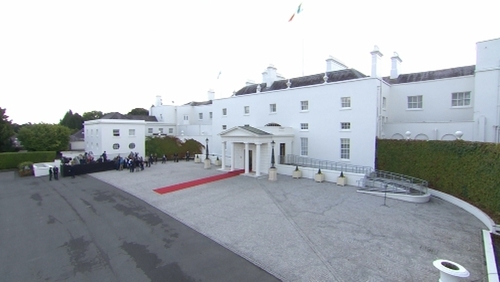 Five of the six candidates appeared on the Tonight Show Presidential Election Special on Virgin Media One - Senator Joan Freeman, Sinn Féin MEP Liadh Ní Riada and businessmen Seán Gallagher, Peter Casey and Gavin Duffy. Faced with the charge that the presidential campaign was bland and boring, Sen Joan Freeman said: "I agree." When asked whether he had dragged the campaign into the gutter, Mr Casey said he had only "pointed out divides" that already existed. He said the role of the President was to be a voice for the people who need to be heard. "Middle Ireland needs to be heard," he said. Co-host Matt Cooper accused candidate Mr Casey of pulling a "stunt" when he announced last weekend that he was taking time to consider whether to continue to run for the presidency. Mr Casey faced calls to withdraw from the race after he said Irish Travellers were simply people camping on someone else's land and that Ireland's recognition of them as members of an ethnic minority was a "load of nonsense". Mr Duffy said it was ironic that the candidates who had turned up for the debate were being asked whether they were wasting their time. "I'm certainly not wasting my time turning up here," he said. He added: "I think people do want a change." Mr Gallagher said Mr Higgins had always "lectured" people on trust and transparency and yet he had reneged on his promise not to run for a second term. He said that had not gone down well with the public. Mr Gallagher added: "How many Government departments are allowed to have unaudited accounts?" Ms Ní Riada was asked about her expenses as an MEP. She has received €225,000 in expenses since her election to the European Parliament. She said that every MEP receives these payments. Ms Freeman said that seven years ago during the last presidential election, the debate had been dominated by money. She said since then more than 3,200 people had died by suicide and the debate was still centring on money. "We need to focus on mental health," she said. Ms Freeman admitted she found the campaign difficult: "I had a ball of fear nearly every time I came to do a debate." Co-host Matt Copper accused Mr Casey of Trump-like campaign tactics. Mr Casey responded: "I think you will find I have been shooting up the polls every day this week." Asked about Mairia Cahill, Ms Ní Riada said: "Mairia Cahill, what was done to her was wrong. "No apology will ever undo what was done to her. I've always said that what was done to Mairia Cahill was wrong and I've apologised profusely about that and it won't undo it." Ms Ní Riada added she would be more than happy to meet with Ms Cahill. "I hope she does get closure on it and she deserves that closure," she added. Discussing the fact that three of the Dragons' Den investors were in the race, Mr Duffy said: "Three of us from the one TV programme is bizarre." Asked whether all three businessmen were egomaniacs, Mr Duffy said it was a "perfectly legitimate issue to raise". He added: "Definitely there should not have been three from [Dragons' Den]. We're just splitting the vote, and I thought it was lowering the tone of the election." The candidates who are entrepreneurs were asked about being in touch with ordinary people. Mr Casey admitted that he didn’t know how much jobseekers’ allowance is. Mr Duffy insisted that he does know the price of a litre of milk. Ms Ní Riada said: "This is becoming a bit of an all-boys' club here again. Joan and I have to fight tooth and nail to get heard." Ms Freeman, founder of Pieta House, said: "Yes I'm a one-trick pony but what a very important trick." She said Ireland would be a better place in seven years time if the theme of the presidency is culture and mental health. There was a different atmosphere to the Virgin Media TV ‘Tonight’ Presidential debate. The contenders certainly appeared more at ease - sitting down and interacting, rather than standing at lecterns and firing potshots. The elephant in the room, of course, was that not all candidates were in attendance - just as RTÉ’s Claire Byrne Live show was hobbled. Viewers were left with a sense, tonight, that this was a post-mortem examination, before the result was known. Meanwhile, today was the final full day of campaigning in the presidential election before voters go to the polls on Friday. All six candidates came face-to-face last night for the RTÉ Prime Time debate. The candidates clashed over presidential expenses and were challenged on their vision for the role of head of state. Separately, Mr Gallagher has issued a statement in response to a report that he was involved in a car crash more than 25 years ago after which a settlement was made by his insurance company. A spokesperson for Mr Gallagher said: "A report in the Anglo Celt newspaper on 6 August 1992 details that David Morgan was awarded a decree of £11,026 plus costs by Judge D Sheehy at Cavan Circuit Court in an agreed settlement against the insurers of Seán Gallagher for injuries received in a minor traffic incident in Ballyhaise, Co Cavan on October 16 1991. "Seán Gallagher was returning from a funeral in Cullies Cemetry, Cavan, and his vehicle bumped into the back of the vehicle of David Morgan. "This happened in a line of traffic within the village speed limits of Ballyhaise, Co Cavan. "Seán Gallagher was travelling at between 5-10mph when this happened. "A very small amount of minor damage was done to the rear bumper of David Morgan's vehicle. "Subsequent to this Seán Gallagher was informed that a personal injury claim was made by David Morgan. "This whiplash personal injury claim was made against Seán Gallagher's motor insurance policy and he was notified of the award made by the court."